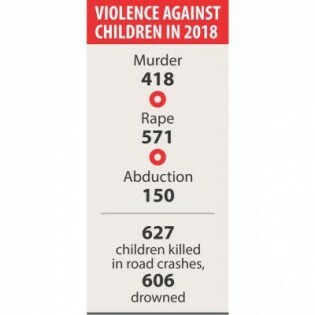 (The Daily Star, Bangladesh) - As many as 418 children were murdered in the country last year, up by 23.30 percent from the previous year, says a report by Bangladesh Shishu Adhikar Forum. In 2017, at least 339 children were killed, mentions the report titled “State of Child Rights in Bangladesh 2018” unveiled in the capital's Dhaka Reporters Unity yesterday. Bangladesh will see the third quickest growth in the number of high net-worth individuals in the world in the next five years, according to a new report of New York-based research firm Wealth-X. No one would realise better than a woman how it feels when a child is snatched away from the arms of a mother and slaughtered, a man is murdered before the eyes of his wife, or a girl is raped. Twelve Nobel laureates and 15 other eminent global citizens yesterday urged the UN Security Council to intervene immediately to end the humanitarian crisis in Myanmar's Rakhine state.